The Four Agreements by international author, Don Miguel Ruiz, a mexican shaman, spiritual teacher and mystic, is a wonderful book that communicates in the most contemporary language some of the practical aspects of what Sufis call Ihsan. • Be Impeccable with Your Word. Speak with integrity. Say only what you mean. Avoid using the word to speak against yourself or to gossip about others. Use the power of your word in the direction of truth and love. • Don't Take Anything Personally. Nothing others do is because of you. What others say and do is a projection of their own reality, their own dream. When you are immune to the opinions and actions of others, you won’t be the victim of needless suffering. • Don't Make Assumptions. Find the courage to ask questions and to express what you really want. Communicate with others as clearly as you can to avoid misunderstandings, sadness and drama. With just this one agreement, you can completely transform your life. • Always Do Your Best. Your best is going to change from moment to moment; it will be different when you are healthy as opposed to sick. Under any circumstance, simply do your best, and you will avoid self-judgment, self-abuse and regret. The Sufic concept of Ihsan is excellence, being impeccable, being the best and doing the best - whatever we may be doing, be it cleaning our dishes, managing our office or standing at our prayer facing the Lord of the worlds. In fact when the Messenger was requested to inform about Ihsan by Archangel Gabriel, he communicated what is Ihsan by giving the analogy that Ihsan "is to worship, is to adore God, the Most High as though you see Him, and if you don't see him, surely He sees you." The Messenger used this analogy to convey the meaning of Ihsan because this is the most excellent of analogy for a seeker of God, because what can be more rewarding for the seeker of God than to have the God-seeing eyes of the Hearts open?! What can be more rewarding for the seeker after God than to have the God-perceiving senses of the Heart such to experience that God is seeing him, her at that very moment, at every moment. When I came across Don Miguel's book Four Agreement it immediately reminds me of Ihsan. Ihsan talks about excellence in all. Don Miguel summarises this beautifully and well, that is to say with Ihsan with his four agreements. In the past post I shared what Zia Inayat Khan said about how each moment offers a choice. He calls us to be cognizant of our influence, recognizing that our thought, speech, and action will have an effect of the whole flow of human destiny. 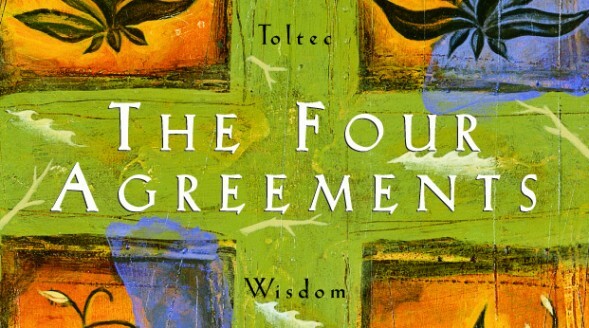 Now towards that the four agreements can be very very effective. And it begins with being impeccable with Word. 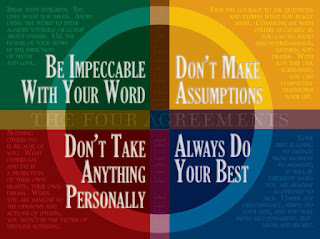 "The first and most profound of don Miguel’s Four Agreements is Be Impeccable with Your Word. While this seems fairly straight forward it takes on many subtle and profound aspects as you begin to practice. Very simply to be impeccable with your Word is to use your Word in the direction of love and truth. It’s not as simple as it sounds. Your word (small case) has to do with the things you say. They make up sentences, phrases that you speak and write. They come out as opinions, or comments, thoughts in your head, or could even make it into policy in some situations. On the other hand your Word is much more. You can create how you feel emotionally by generating emotions, and then you feel them. You can create dynamics of respect in relationship by being silent and listening attentively. You can create a different experience for your self and others by refraining from an emotional reaction. You create an income for your self by how well you express caring in the activity of your work. You create a different self image of your self by putting the power of your faith in a thought you have about your self. 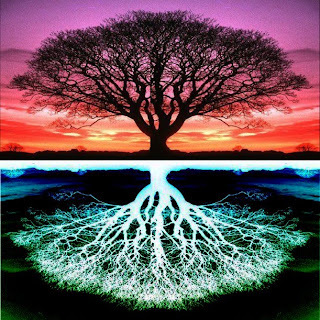 This can happen in a very subtle and almost passive way of just accepting what you think about your self as true. You express in a multitude of ways through out the day and being impeccable with your Word applies to all of them. Silence can also be Impeccable. Silence is an expression. And sometimes silence and refrain says a lot more than words can. Your actions are a part of how you create. To hit someone doesn’t fall into the category of expressing your self in the direction of love and truth. To greet someone with a kiss on the cheek is an expression that says more than a thousand words can. To really master being impeccable will require that you heighten your awareness not just to the words you say, but also to the emotions you express, your attitude, your actions, and where you express the power of your belief. You will need to develop a discipline of mindfulness to be impeccable in these expressions through out the day. To Be Impeccable with Your Word is an art requiring constant vigilance. It is not something that you can decide to do one day and master by the end of the week. The mastery of any art, like music, painting, or sculpture, requires practice. To master the way you express your emotions, actions, thoughts, beliefs, will take practice just like any other art. In the beginning it will be challenging to just learn the basic skills. A beginning painter will likely throw out his first drawing. He will also throw out many other early works. However those efforts are not wasted. As he pays attention to the details of his brush strokes he learns skills with every attempt. It takes time to master the various skills of mixing colors, brush strokes, choosing themes, and mastering light and shadows. With each painting he finishes, whether he keeps it or throws it away, he has improved himself as an artist. You too will let go of what you created in your life years ago, and work on bigger and better creations as you develop. Each day is an opportunity to create a new piece of art with your life. Last years art is already far behind you. Learn, grow, and develop your skills through your creations, but don’t let them define you as an artist. When you apply the practice of doing your best to be impeccable you discover that it has incredible rewards. 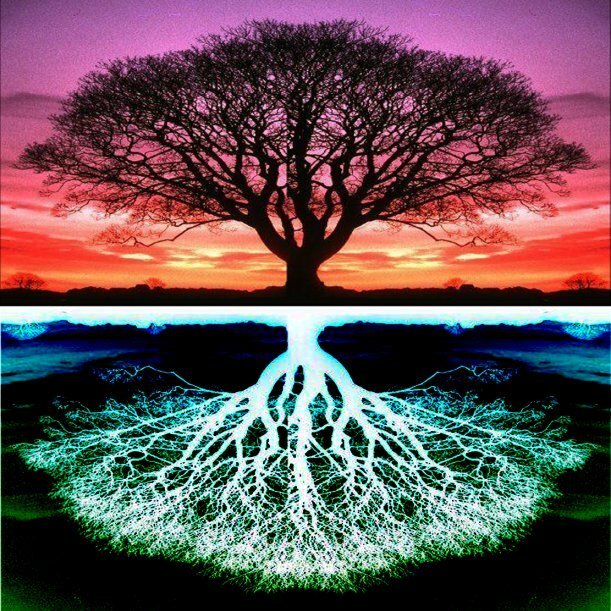 To express your self in the direction of truth and love allows you to create your life as a masterpiece of beauty. To master being impeccable with your word will take many moments of practice. You will likely throw away many of your attempts as being clumsy and not what you want. But that is okay. For with each action and attempt, you improve as the artist of your life. Be careful not to believe the judgments that are likely to come from that inner judge. Make a commitment to do your best everyday and it will help you avoid self judgments as you practice and improve. Remember that in the midst of all these expressions that the real art you are working on is your self and you are worth taking time for." Who is Sufi? Sufi is the one who practice ihsan. Sufis are those who strive towards being impeccable. May the Generous Giver of Gifts grant us such spiritual station. Commentary on the Four Agreements by Don Miguel Ruiz - international best seller author, mexican shaman, spiritual teacher and mystic.